The Artist, and thence by descent to Madame Van Dongen, Paris (until the 1960s). Galerie Motte, Geneva (no. 7001); sale, 7 November 1969, lot 33, where purchased by the husband of the present owner. Paris, Galerie Charpentier, Van Dongen, March-May 1949, no. 78. Rotterdam, Boymans-van Beuningen Museum, Kees Van Dongen 1894-1949, May- July 1949, no. 47 (where dated 1912). Sold with a photo-certificate from the Wildenstein Institute dated Paris, le 20 mars 2000. 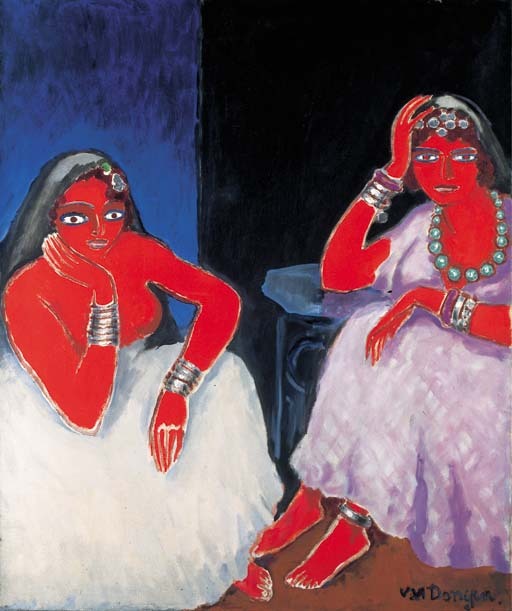 Of all Van Dongen's journeys, it was his visit to Egypt in 1910 which was to have the profoundest effect on his painting. Matisse had experienced a similar change in artistic direction following his visit to Morocco in 1912. The assured two-dimensional silhouette of Egyptian sculpture chimed with Van Dongen's innate sense of line and pattern, and this translates in Marchandes d'herbes into broad planes of rich, unmodulated red and blue superimposed on a shallow perspective. The irrepressibly sensual aspect of Van Dongen's art - the odour of 'opium, ambergris and eroticism' memorably identified by Louis Vauxcelles - also plays its role. The women's almond eyes tilt invitingly at the spectator, while their bulky jewellery, accented with generous taches of white pigment, coils seductively around their wrists and ankles. Evidently delighted with the picture, Van Dongen included it in a picture of 1913 where he playfully altered the colour scheme to match that of the full composition (fig. 2). It was Van Dongen's practice to surround himself with his own pictures as a sort of visual library, and he kept Marchandes d'herbes close by him in his studio for many years, even having himself proudly photographed in front of it in 1959 (fig. 1).